Hans Rosendorff was a leading figure in Western Australian bridge and a major influence in the development of Australian bridge administration, journalism and national and overseas competition. Hans was born in Berlin in 1910. His mother was Western Australian and his father was a leading German barrister. He studied law in Berlin, Paris and Heidelberg but politics interrupted his studies. A social democrat, he was strongly opposed to Nazism and, after his father had warned him that his arrest was imminent, fled to Paris. After a brief stay there, he moved in 1937 to Western Australia to stay with relatives of his mother. The relatives lived on a farm in an environment which was a far cry from the major European cities that had been his life until then. The memory of his first sighting of the broken down farm and the rabbit proof fence became a favourite story. Before the war, he tried his hand at many different occupations including farming and travelling picture shows before joining the army. He also married Jean in November 1942 beginning a marriage of 41 years. He was somewhat amused that her marriage to him meant that she had to report to police weekly as the spouse of an enemy alien while he, being in the army, was under no such restriction. After serving overseas he returned to Western Australia and in 1950 joined the staff of the West Australian where he eventually became Chief Librarian. Hans was first recorded as playing bridge in Western Australia in 1939 and he was for more than thirty years one of the strongest bridge players in Western Australia and had victories in all the major state events during this career. He was in the winning Open Team in the 1961, 1964, 1969, 1971 and 1973 championships and usually in a place otherwise, frequently playing with Geoff Holman. He won the Men’s Pairs in 1962 (with Charles Porter), 1972 (with Mike Hopper) and with his son Nigel in 1975. He won the open pairs in 1962 and 1973, the men’s pairs in 1975 and 1980, the individual in 1977 and the mixed pairs (with his wife Jean) and open teams in 1982 (when he was 70). As with the teams, he was usually in the places if not the winner. He was captain of the Western Australian open team at the ANC in 1958 and 1961-63 and a member of the team in 1964-66, 1969, 1973 and 1975-76. In all, he represented the state eleven times. Western Australia was quite isolated from competition in the 1940s and most of the 1950s but Hans had two national results. In 1945 he came seventh in the Australian Pairs competition with Joe Katz (an Austrian refugee) and came fourth in that event in 1958 with Alex Gerondal. He came third in the national par point event set by Mick Sullivan and Bob Williams. He was the first Western Australian to win a national title, winning the individual at the ANC two years in a row in 1965 and 1966. In international competition, Hans entered the record books, as, to this day, Australia’s most successful non-playing captain. He was non-playing captain of the Women’s teams that won the Far East championships three years in a row between 1973 and 1975 and won again in 1977. He was also non-playing captain of the women’s team that came fourth in the Far East in 1972 and competed at the World Open Team Olympiad in 1976. Hans’ contribution to the successes of his teams was not the stereotypical contribution of a successful non-playing captain. His contribution was on the human rather than tactical side. In an era when it could not be automatically assumed that a non-playing captain would show a lot of interest in the women’s team, Hans very much set a standard. He passionately wanted the teams to win and, just as passionately, believed that they were good enough to win. He was totally involved in the team’s performance. The level of passion was not always conducive to dispassionate analysis of hands without emphasis on results and there was no lack of debate about tactics between captain and team. Disagreements though mattered little because he also respected his players’ ability and let them play their own game. He gave his opinions forcefully but if people did not agree or got other advice, there were no hard feelings. And he could be fun – again something not always associated with high level bridge competition. His sense of humour was never far from the surface and he was always somebody that players could relax and laugh with. After having experienced a good number of captains, including several VERY analytical ones, I came to appreciate how valuable Hans’ attributes as a captain actually were. He pretty much let his players play their game and I don’t know that he had any tactics or strategies other than to have his players win. His positive belief in his team and his commitment to them as bridge players, rather than women bridge players was, I think, much more helpful than most approaches taken by other captains. Hans also became the first Western Australian to captain an open team at the Far East Championships in 1982. Performance at the table though was only one aspect of Hans’ contribution to bridge. 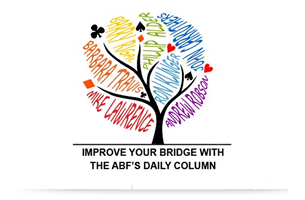 He was the first in Australia to have a regular bridge column (in the West Australian) from 1964 and published articles in Australian Bridge. He was long prominent in administration while still playing. He was present at the first meeting to form an association in WA in 1939 but was not among the early office holders because of the war and his status as a German refugee would not have made participation easy. He was President of the old association in 1961, 1962 and 1964 and on the committee most other years. He was President of the restructured Bridge Association of Western Australia (BAWA) from 1975-78 and Secretary from 1978 until his death in 1983. His presidency was a stormy affair as he did not want to spend money on property but focussed on improving competition. He was the main force behind new teams events, youth bridge and congresses in WA and he always wanted to advance interstate bridge. He pushed strongly for the WABA to become a true State body in the sixties (and in fact left the club when it did not move quickly enough). We now take for granted the full national coverage of Australian bridge competition but the reality is that it took a lot of effort to bring this about. Western Australia was the most adversely affected by the tyranny of distance, particularly in the times when air travel was very expensive. WA did not send a team to the national championships until 1958, when they were held in Adelaide. Regular attendance began in 1961. Hans promoted truly national bridge in a number of ways. He promoted awareness of the issues facing the States outside of Victoria and NSW, which totally dominated competition at the time. Within WA he worked to create awareness of national issues and the importance of national and international competition. He was for a long time, WA’s delegate to the ABF. “Women comprise the majority of members of every Association and the game is played by more women than men all over the world. 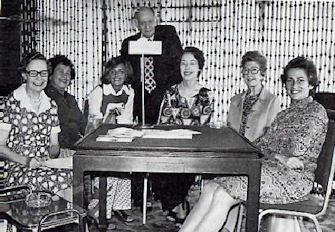 Women make the Associations run by their drive for funds, by their work generally and by the time they make available for the game as a whole. Hans was an excellent networker who was very skilled, when required in finding the right way to get influential people on board with the plan of the moment. This skill was put to good use in organisation of national congresses. After the Perth championships, Hans showed his commitment both to Western Australian and Australian bridge by producing a booklet on the hands played in the congress to raise funds for an Australian team to compete in the 1968 Olympiad in Paris. He commented in the booklet that “whether it will be really profitable will depend on sales and all Associations throughout Australia which comprise the Australian Bridge Federation must assist in this task.” The exercise though was successful in WA through his personal efforts but not elsewhere and Hans felt very strongly that the Eastern States were not pulling their weight. He was heavily involved in the organisation of the ANCs that were held in Perth and up until the day of his last illness he was actively planning for the 1984 Perth ANC. He collapsed in 1983 while coaching the WA youth team. Like many of the other figures behind the development of Australian bridge, Hans had a memorable personality – quite capable of infuriating but always ultimately remembered with affection. Ailsa Smith remarked that “Hans contributed with his enthusiasm and willingness to fight for new ideas, his interesting and intimate personality – that meant that even if one had an almighty fight with him, he would always introduce some new idea of interest and one would forgive him”. Hans was not noted for patience and Keith McNeil commented that “equipped with a volcanic temper his rages were magnificent to see, but usually within 24 hours he was back to normal and typically bearing no grudges or ill will to the objects of his outburst”. He was a man “with a big heart, an enormous mischievous sense of humour, a big voice (a frequent joke being that he was the only person in Perth who could speak to colleagues in the eastern states without using a telephone) and a huge store of hospitality and fellowship which he bestowed on all his friends like a profligate millionaire”. Hans is remembered appropriately in the Hans Rosendorff Memorial Women’s Teams, a premier event that has traditionally attracted strong interstate competition to Perth (the first winners were the team of Norma Borin, Ailsa Tandy, Lidia Beech and Margaret Bourke); and the ABF’s Committee of Honour. The ABF also donated funds to the James O’Sullivan Fund in his memory. Thanks particularly to Ailsa Smith and to Nigel Rosendorff, Sue Hobley and Liz Havas for contributions by email and discussion to the article.